Click if you really, really wish you had one of these. Or just to see a larger version of the photo. Growing up, I heard the term “tornado slide” used to describe this piece of playground equipment, and I’ve always loved it. This one’s in Harrison Smith Park in Upper Sandusky, Ohio, and I’m pretty sure it’s The Best One In The World. I mean, look at it. All metal. Three full revolutions. Angle of descent: Approximately badass degrees. Turns tight enough to cause right-leg friction burns on the center pole. An ascent that includes a landing, for Pete’s sake, presumably so you can acclimate to the altitude and get even more scared. Look at the bottom of the slide: I’m pretty sure that kid was kissing the ground out of his thankfulness for having survived – Oh, God, no, wait! Look closely! I think there’s another kid down there. THE SLIDE WAS BAITING US INTO COLLISIONS AND TRYING TO KILL US ALL. Yeah, I loved this thing. I’m pretty sure it was installed in 1976, in tune with the nationwide bicentennial celebration, and that around the time of this photo, it was brand new. Check out that line of thrill-seekers. I’m one step up from the halfway landing, five years old. That’s my mom – also an adventurous type – right behind me. 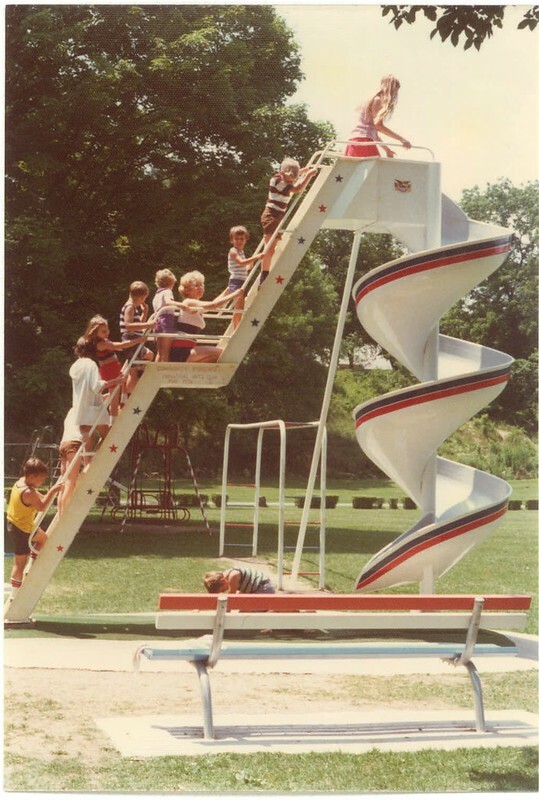 Playgrounds have changed a lot in the three-plus decades since this slide was installed, including the park in Upper Sandusky. But the World’s Best Tornado Slide lasts. My daughter’s tackled it. Maybe my nephews, too. Last I checked, it’s still there – visible on Google Maps, even. Waiting.